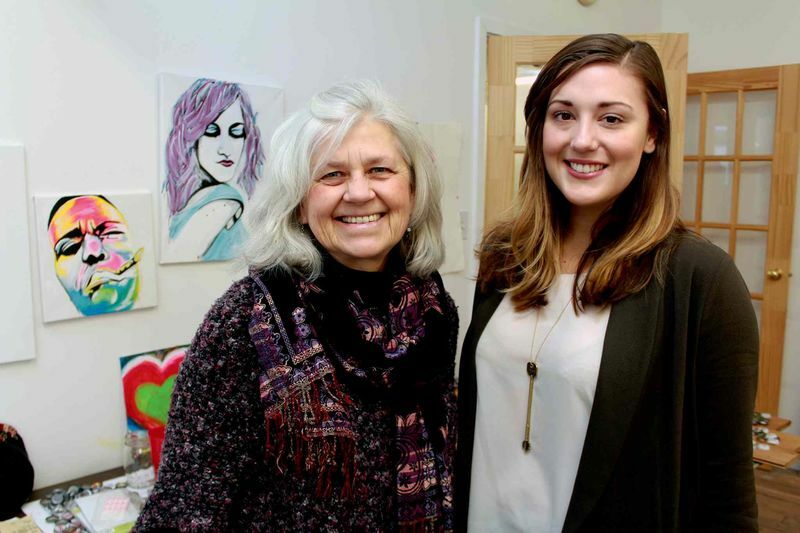 Rebecca Henderson (right) has teamed up with Lucille Bart of Artbeat Studio to put on the 24-Hour Art-a-thon to raise money for the studio and its artists. The duo is standing in artist Kyla Betker’s studio, whose work is posted on the wall behind them. A Charleswood resident is raising money and awareness in the name of art. Second-year Creative Communications (CreComm) student Rebecca Henderson is organizing the first-ever 24-Hour Art-a-thon in support of Artbeat Studio (Suite 4-62 Albert St.) from Feb. 6 at 5 p.m. to Feb. 7 at 5 p.m.
Red River College’s CreComm program requires its second-year students to work on a year-long assignment called the Independent Professional Project (IPP), and Henderson has been working on putting together an event for the Exchange District-located charity organization. Originally, Henderson proposed to throw a concert for her IPP, but that idea was shut down by a panel of instructors. She proposed the idea of doing an art-a-thon for Artbeat Studio, and the panel allowed her to do it. According to Artbeat Studio executive director Lucille Bart, the studio is geared toward mental health recovery. Nigel eventually found that making pottery was helpful in his recovery. He studied and graduated with a degree in fine arts. Nigel is now the studio facilitator, working directly with the artists. Henderson wanted to incorporate the studio into her project because she wanted to change how many people think about mental illness. Henderson explained that during the 24 hours, people can pledge money through The Winnipeg Foundation’s website (wpgfdn.org) on Artbeat Studio’s page. “The Winnipeg Foundation has offered to donate a dollar for every five dollars pledged,” Henderson said. At the end of the 24 hours, the artists will go on a well-deserved break but return to the studio for a celebration. Henderson arranged the donations and pledges so that the money from the auction goes towards the artists and the money from the pledges can go towards the studio. “Artists are a marginalized group of people, and it didn’t feel fair to take their hard-earned money away from them,” Henderson said. There will be live music and refreshments at the event.